His last final world tour didn’t work out too well – it’ll take more than that to keep the Prince Of Darkness from the road for long – but it seems the end is finally approaching for one of metal’s greatest. 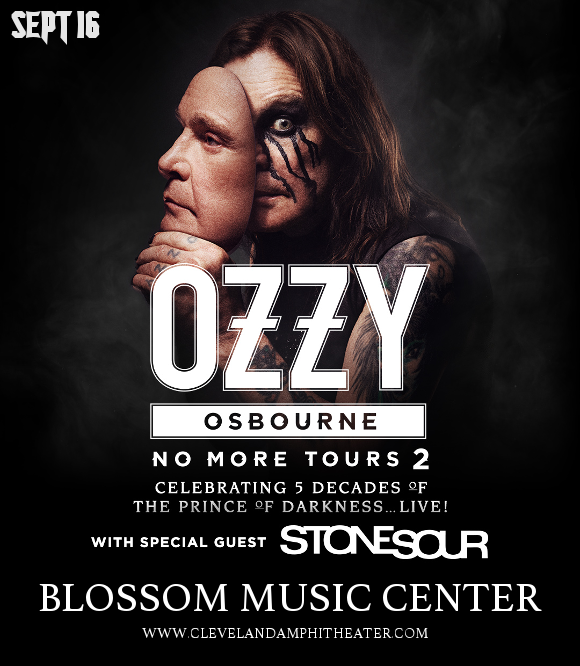 In 2018, Ozzy Osbourne returns with with No More Tours 2 – a TWO YEAR long slog that is expected to finally mark the end of Ozzy’s glorious career. With the legendary Zakk Wylde on guitar, Blasko on bass, Tommy Clufetos on drums, and Adam Wakeman on keys, this epic lineup promises a performance you’ll never forget. As if that wasn’t enough, Corey Taylor’s Stone Sour will open each and every show!! They’re on their way to the Blossom Music Center on Sunday 16th September 2018 – get your tickets NOW before they sell out!! Although following this tour Ozzy Osbourne is expected to really go into retirement, he will still play select shows now and then on special occasions. "I'm not retiring,” he firmly said in an interview "It's 'No More Tours,' so I'm just not doing world tours anymore. I'm still going to be doing gigs, but I'm not going on tour for six months at a time anymore… I'd like to spend some time at home." It’s good news for anyone who wants to catch him live on tv. However this is probably going to be your last chance to catch him in person – we would recommend getting your tickets NOW while you still can! !